Bodet Time Box - Baztech Incorporated (Pvt) Ltd.
Time and Attendance Software with capacity for managing up to 100 employees. 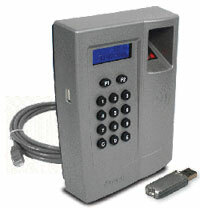 Biometric clocking in machine: fingerprint identification. USB key for wireless installation and IP connection to the local ethernet network. Easy to use time recording system. Numerous standard printouts and ability to export Time and Attendance information intoExcel®. Management of public holidays, breaks and overtime.